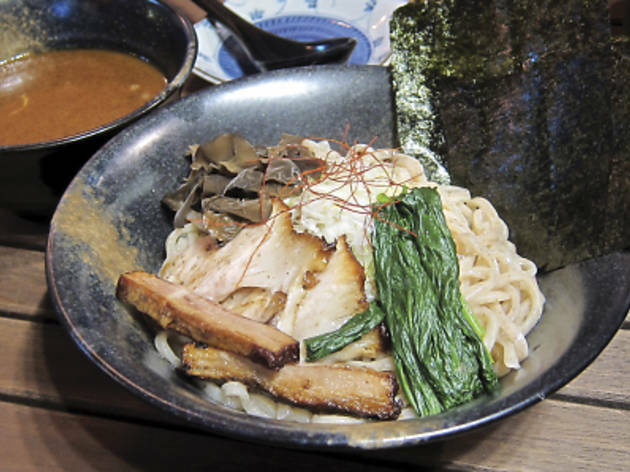 Although ramen is featured as the signature dish here, from talking to the staff, this newly opened Japanese restaurant has nothing to do with the famous Mutekiya ramen institution in Ikebukuro. Still eager to give this place a try, we started with sliced Japanese yam ($48), which was cool and refreshingly crunchy, making it a great appetiser for the summer. We also tried some of the grilled and yakitori items as well (note that these are only served during the evenings). The homemade chicken meatball ($45) was delicious, especially with the crisp bits of chicken cartilage that were mixed into it. The sweet barbecue sauce, soy and egg yolk also added plenty of flavour to the minced meat skewer. This is a must-try item. The grilled chicken heart ($22) was another highlight, tender with plenty of chargrilled flavour. On the other hand, the grilled ox tongue ($68) arrived chewy and rubbery. A disappointment for a usual favourite. We also tried the grilled veggies, the best of which was the French horn mushroom ($22) seasoned with barbecue sauce. The ginkgo nuts ($16) were bitter and the texture too hard and sticky. The Japanese green peppers ($16) were another letdown, undercooked, bland and despairingly soggy. 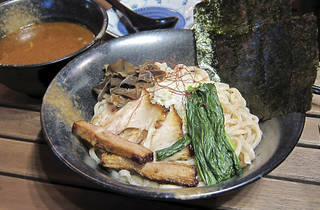 9 Mercer St, Sheung Wan, 2815 5322. Mon-Thu 11.30am-3.30pm, 6pm-11pm & Fri-Sat 11.30am-3.30pm, 6pm-11.30pm. Closed Sun. Dinner for two: around $400.